With Microsoft Word 2013, quickly create your own budget planner with a formula that can calculate your weekly, monthly or annual expenses for you. You can save the file as a Word DOCX document or as a Word DOTX template file that you can revise as needed each month. 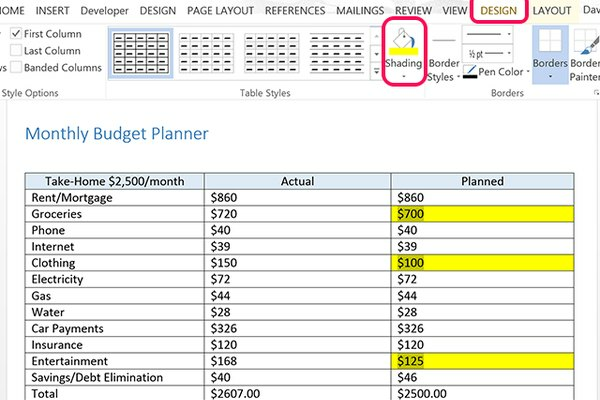 If you have Microsoft Excel, there are many budget planner templates that you can customize for your own use. 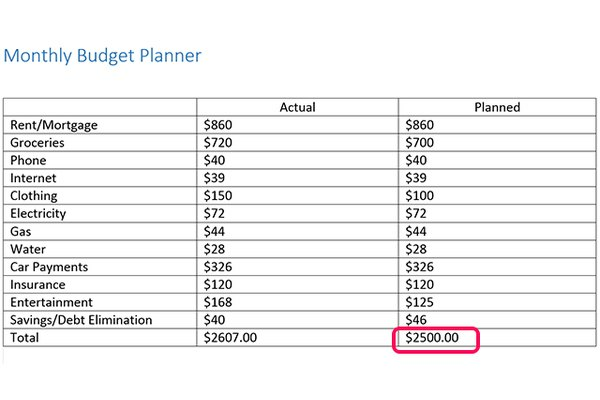 At the time of publication, there are no Microsoft budget planner templates available for Word 2013. 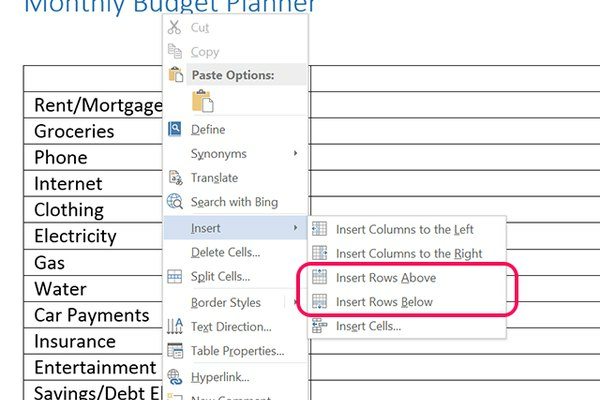 Open a new Word document and type a title in the first line, like Monthly Budget Planner. Highlight the title and make it stand out by clicking the Home tab and selecting Heading 1. Press Enter to put the cursor below the title. 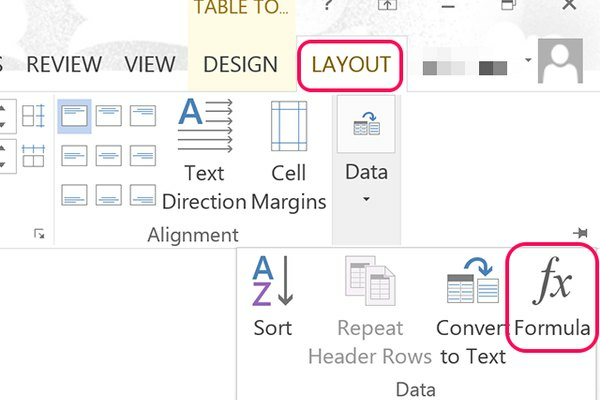 Click the Insert tab, click the Table icon and select Insert Table in the drop-down menu. Change the Number of Columns menu to 3, so you'll have a column for expense items, current spending and planned spending. Change the Number of Rows to 12 or more so you can list each item. You can add or remove rows as you work on the table. Type the list of your monthly expenses in the first column, beginning with the second row. In the last cell, type the word Total. 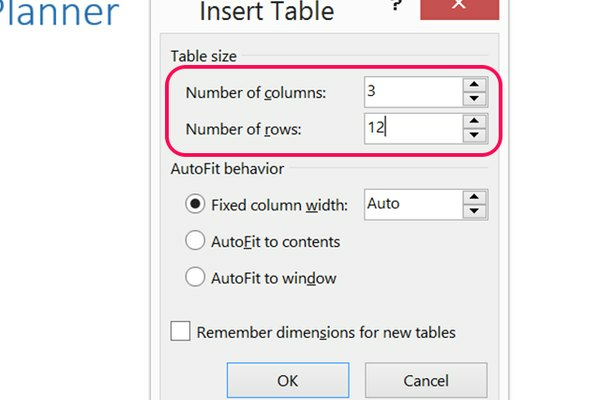 To add more rows, right-click a cell, select Insert and then click Insert Rows Above or Insert Rows Below. To delete a row, highlight the row by dragging the cursor across it, right-clicking and selecting Delete. In the dialog box that opens, select Delete Entire Row. When you're finished typing in a cell, press the Down Arrow to go to the cell below. Type Actual in the first cell of the second column. In the cells below, enter the amount of money you actually spent on each item in the last month. Place the cursor in the last cell of the column so you can have Word calculate the total. 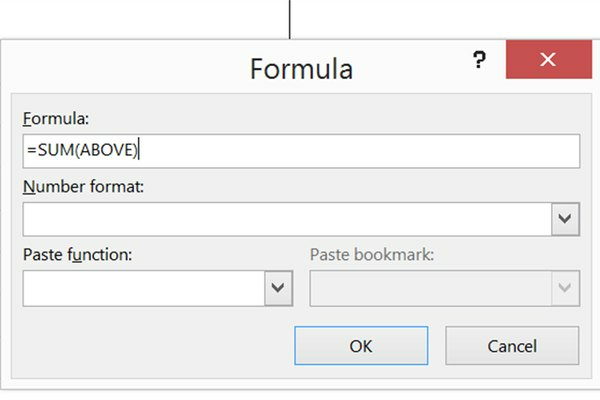 Click the Table Tools' Layout tab, select the Data icon and then click the Formula icon to open the Formula window. Click OK to accept the default =SUM(ABOVE) formula. This formula adds all of the values in the column and presents the total with a dollar sign. Unlike Excel worksheets, the formulas in a Word table are not dynamic. If you change any value in a column, you'll need to enter the formula again to recalculate the total. Type Planned in the first cell of the third column. In the cells below, enter the target amounts that you want to spend on each item in the month to come. In the last cell, insert Word's =SUM(ABOVE) formula just as you did in the bottom of the second column. Change the table's formatting as you wish. You can change the font and font size from the Home ribbon options just as you would any other text in Word. 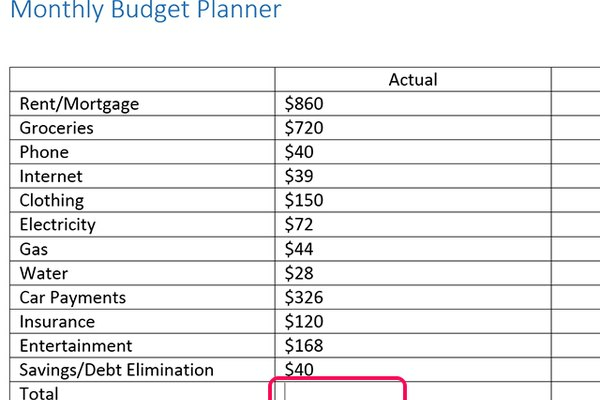 To emphasize parts of the planned budget that you need to work on, you can highlight them in yellow. To do this, first, Ctrl-click each cell to highlight. 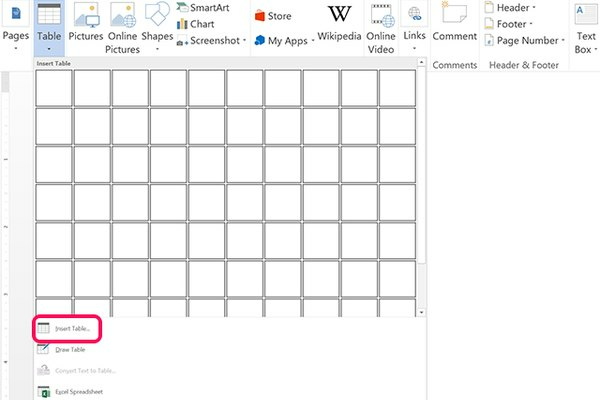 Click the Table Tools' Design tab and then click the Shading icon. 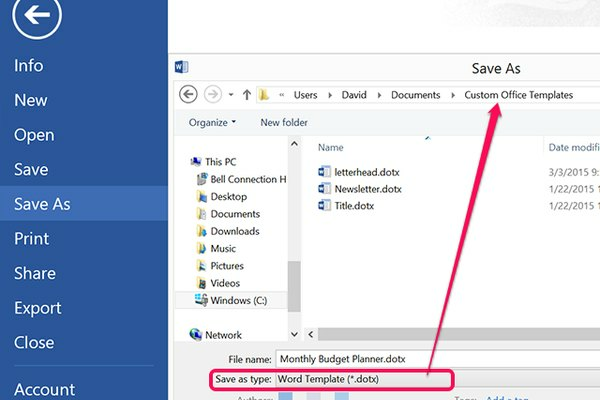 Save the budget planner as a Word template or as a Word document by clicking the File tab and selecting Save As. If you select Word Template (*dotx) in the Save as Type menu, the template is automatically stored in the Custom Office Templates folder. You can then open it at any time by selecting New and then clicking the Personal option above the Blank Document template icon.